In every business across every industry, scoping out the competition is a major part of a successful run. If you don’t know how your competitors are performing and have a good idea of the things they’re doing right (and, possibly, the things they’re doing “wrong”), chance are you’ll see a bigger payoff for yourself. As a vacation rental host or Airbnb host, doesn’t it make sense to follow the same basic business tactics? We certainly think so. 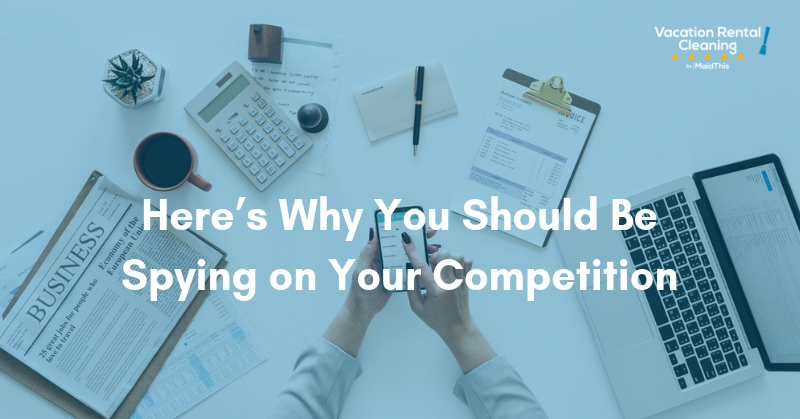 Here are our arguments as to why you should be spying on your competition – plus what kind of nuggets you should be collecting from that information goldmine. By comparing your listing, you’re being a smart host. We’ve said it a dozen times: As a vacation rental host, you’re a small business owner. Much of your success or failure falls into your own hands. As a host, this translates into bookings. Are you getting booked as often as you’d like? How often are you opening availability and not getting booked, especially over weekends? If you’re not happy with your booking consistency, what could you be doing differently to boost your occupancy rate? Are you offering amenities that guests want and appreciate? What could you be doing better or offering that would improve their stay even more? If you want to have solid information on what you could be doing differently, you’ve got to do a little digging. These answers won’t simply drop into your lap; they take some research. Spying on the competition helps you better gauge how your listing is doing compared to others in your area. Here’s a question for you: Are you using your platforms’ search tool to its capacity? Airbnb has one of the most robust search engines for vacation rentals out there and while it’s great for guests trying to hunt down a fantastic place to stay, it’s a goldmine of details for hosts looking to get an edge. Narrow down other listings that compare to yours in size and guest numbers. It’s smart to know just how many other listings like yours are in your neighborhood or general vicinity. Make a list in a spreadsheet. How many views are they getting? How booked up are they compared to availability? What’s their average nightly rate? What unique amenities do they offer, if any? See how other listings compare to yours and what you could possibly improve to make it better. There’s almost always someone out there who can do things a little better than you. If such a host exists, what are they doing? How can you implement that into your own listing? Learn about why their guests like them so much. Guests often leave specific comments in their reviews to detail what was so great about their hosts. Use this information to your advantage! Copy the cool kids – it’s totally okay. The more you know, the more you can improve your own listing and, hopefully, your occupancy rate. Though it takes some time to peruse the stacks and pages of information, it pays to know what your competitors are doing – quite literally. So the next time you’re thinking about how to improve your own listing, start by looking at the other guys’. You just might find your answer!